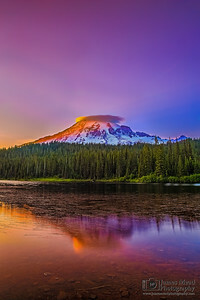 The setting sun reflects off Mount Rainer's west slope as Lenticular Clouds form around its peak at Sunset. The still waters of Reflection Lake capture the serene beauty of the Alpine setting with a stunning reflection. 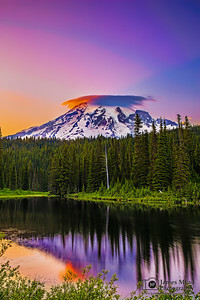 Lenticular Clouds form over Mount Rainier as it reflects in the waters of Reflection Lakes at Sunset. 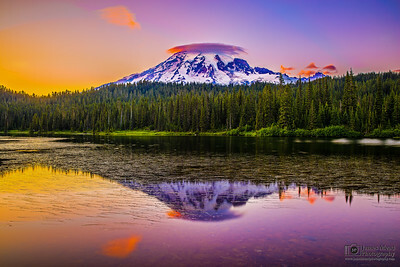 Alpenglow begins to set in over Mount Rainer and Reflection Lakes as the sun sets in the west.